Is It Good? EGOs #2 Review – AiPT! Written by Stuart Moore with art by Gus Storms, EGOs #2 continues the adventures of superheroes in the far future as they band together to defeat a seemingly insurmountable cosmic threat. Is it good? There’s a bit more to the premise of EGOs than the description I provided above, but not enough to make it stand out against the multitudes of excellent science fiction and/or superhero comics that readers have to choose from, whether they’re browsing the stands at their local comic shop or picking through some classic comics collections at the bookstore. There are some interesting ideas on hand, sure—like a mother in law that’s so evil that she literally tried to conquer the universe on more than one occasion—but none that are so groundbreaking that they make up for EGOs’ mediocre execution. The protagonists of this story are Pixel and her husband, Deuce, with their estranged son serving as the narrator. Pixel is the super-powered daughter of the aforementioned evil mother in law, though the extents of her powers are still unclear at this point, and her mother doesn’t appear to be much of a threat anymore. Deuce is a classically dashing rogue of the Han Solo variety with the power of super-persuasion. He leads a team of weird-looking heroes, but not much is known about them at this point. Frankly, I couldn’t follow much of what was going on in this issue and the previous one, partly because it was so hard for me to care about the characters. Stuart Moore has said that the marriage of Pixel and Deuce is particularly interesting to him, but Saga this is not. I don’t buy Pixel and Deuce as a couple. I don’t even buy them as a couple that isn’t right for each other. They just seem to be two people that were thrown into a marriage for the purposes of a story, with no plausible reason for why they would have been drawn to each other in the first place. Gus Storms tries his damndest to make the story more interesting, with an eye for bizarre detail and gore. He’s a newcomer to the comic book world, though, and it’s clear that he could use a lot of work. His facial expressions are weak, his body language is stiff, and his action scenes lack a sense of motion. He does all the inking and coloring himself, and while his muted color palette is generally competent, if unimpressive, he might benefit from another inker. His lines are a mess, and often look unfinished. Storms has the potential to be a great artist someday, but he hasn’t gotten there yet. 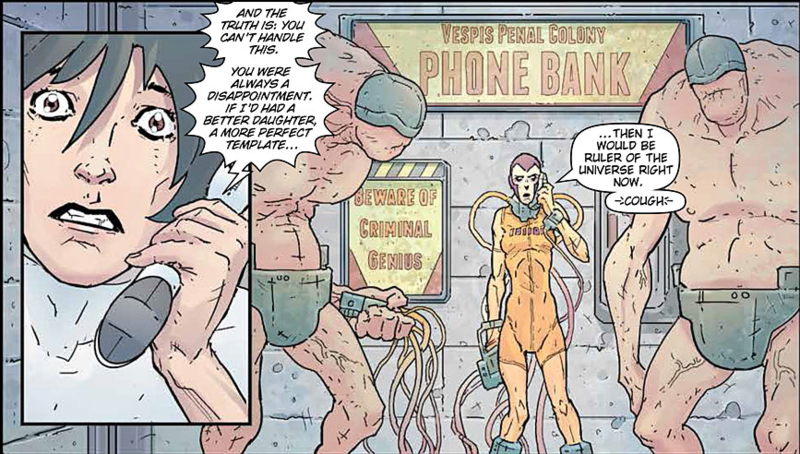 Stuart Moore must shoulder most of the blame for this comic, though, because he is not only the writer, but he is even listed as the editor. I don’t know about you, but this seems incredibly suspect to me. While I was getting my degree in Writing, I also spent years as a tutor. I learned a number of lessons through that job that carried over to my writing career, but one of them is that you can never be your own editor. Well, you SHOULD take the time to edit your own material, but that’s a given. A real editor should be an entirely different person that can honestly provide a second opinion. It’s frustrating, because I think this book could have significantly benefitted from a second set of eyes. As I read this comic, I kept imagining the kinds of conversations I would have with Moore if he were sitting with me at the Rowan University Writing Center. Among other things, I’d tell him to cut down on the technical mumbo jumbo, give the story some more room to breathe, and focus more on character development. I doubt that any of that was discussed when Moore was consulting with his own editor. Nope. But it might be able to improve if Moore and Storms get some help.